Sandals has long been recognized as a leader in luxury, all-inclusive resorts, racking up awards year after year from travel publications and industry organizations. During the past three decades, the company has earned practically every accolade the business has to offer, ranging from TripAdvisor Travelers’ Choice awards to Brides Best Honeymoon awards and PADI Green Star awards. All of this success, however, has not caused Sandals to slow down in its efforts to surprise and delight guests. The company, which includes 16 resorts throughout St. Lucia, Jamaica, Antigua, the Bahamas, Grenada and Barbados, is in the midst of completing an impressive list of new construction and renovations. Described as Love Nest Suites, the new beachfront butler accommodations at Sandals Montego Bay offer direct access to the resort’s swim-up river pool. They also feature wall-to-wall doors showcasing stunning views of the Caribbean. 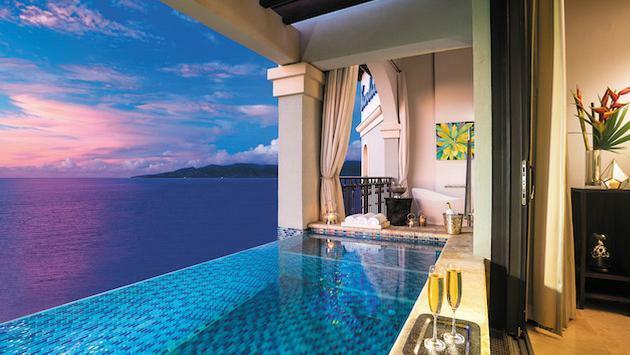 The first over-the-water luxury villas throughout the Caribbean can be found at a Sandals resort. The new accommodations, at Sandals Royal Caribbean, include such drool-worthy features as see-through glass floors, over-the-water hammocks, private infinity pools and outdoor showers. Located in the Windsor Tower, which was recently renovated, the new suites at Sandals Royal Bahamian run parallel to the water—meaning you can jump in right from your room. There’s also a separate living room and bedroom in these accommodations. In addition to the variety of new suites and the upgrades to existing accommodations, Sandals has also opened an entirely new property in Barbados. An all-suite resort, Sandals Royal Barbados features the company’s first rooftop pool and bar, first four-lane bowling alley and first men-only barbershop. There’s also five world-class restaurants and Skypool Suites, Swim-up Suites and Millionaire Suites. Meanwhile, Sandals Grand Antigua will celebrate a reopening as 2017 draws to a close. Voted the “World’s Most Romantic Resort” on numerous occasions, the property is located on Antigua’s famous Dickenson Bay. The renovated resort offers 11 five-star global gourmet restaurants and seven bars. Not to be outdone, Beaches, (the sister brand to Sandals but focused on all things family vacation oriented), also has its own list of exciting new offerings and upgrades. The brand new Beaches Turks & Caicos is scheduled to open December 14. The property is located on a 12-mile ribbon of Caribbean sand that is known as one of the world’s best beaches. There’s also a sprawling 45,000 square-foot waterpark; four different villages and roaming Sesame Street characters. The new Turks & Caicos property will also showcase authentic Indian cuisine and two food trucks, one of which features ice cream. Sun, sand, a multitude of dining options and luxuriously innovative accommodations: It's a vacation combination that can't be beaten.